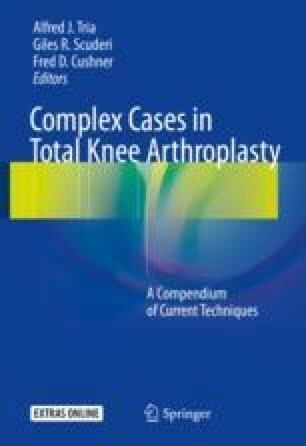 Periprosthetic femur fractures are the most common fracture that leads to total knee arthroplasties. The undisplaced fracture can be treated nonoperatively. If the fracture is displaced, the femoral component must be evaluated for stability. If the component has enough underlying bone attached to it, fixation with component preservation may be possible. If the femoral component is completely loose from any underlying bone, replacement is the only alternative. Internal fixation preserves the original implant but exposes the patient to a longer period of recovery and possible nonunion. Total replacement is much more invasive but may be more predictable.